There are so many decisions to make when deciding to write a blog. Here are my Top 10 Decisions to make before starting a blog. 10) How often are you going to post? Daily? Weekly? Monthly? 9) Will you write your blog as you, or under a pen name? 8) Do you have the time to read and reply to all the comments people make? 7) What website will you use for your blog? Wordpress? Blogger? Others? There are lots. 6) Are you willing to pay for your blog? Your domain name? 5) How will you get followers? Do you already have people who will follow you, or do you have to go find them? 4) Are you ready to invest time in looking at other blogs? Reading other blogs and commenting is one of the best ways to meet other bloggers. 3) Is your blog unique or is there another one just like it? 2) Have you looked at Blog Hops? Blogs that promote other bloggers? We hope that all of you out there are loving the blogs you’ve created, and we hope that you’ll keep inspiring others to create blogs. 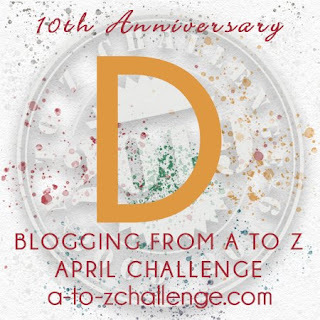 The A to Z Challenge is what inspired me to create my blog, and it has introduced me to the best community of bloggers in the world! Thanks for going on this crazy ride with us! I love how the list gets better and better. Yay Jayden! Great D post for the group. There really are many decisions to be taken about blogging and I smiled as I went down your list and thought of how I had navigated them. Blog hops are really wonderful I think. Thanks for the post, I have written Post : "Drum" on D letter. Hey Vincente, what's up? I would rather not pay for a blog. I tried with Hostgator and what a mess that was! I don't like all the technical stuff like getting your blog in search engines and how to use traffic tactics. UGH! It's also way too expensive for me. I have two blogs, one on Wordpress and one on Blogger. I choose to blog as a hobby and for the pleasure and not for the "hits" or "views" or "followers". Initially, it was about getting creative and practicing my writing skills, which I'm not very good at, in fact, blogging was difficult at first. Staring at a blank white screen was dreadful. So, instead, I started participating in blog memes and then it became a social platform which I don't mind. I know if it wasn't for getting involved in things like the AtoZchallenge, I probably wouldn't be getting any feedback (comments)so there's that. Hii..I signed up today for challenge! My name is not on the list.. pl help!! Great questions to ponder! I'm posting every day except Sunday this month. You'll never find me using a pen name on my site. I think it's important to read & respond to each comment, even if it's a single line of thanks. I use Wordpress. In fact, I made the change from Blogger to WP my first year participating in the A2Z Challenge. I have my WP blog with Arvixe, so yes I pay to have it hosted but supposedly my domain is at no cost. At this point in the game, it's not nearly as important to have followers but I'm happy for those who wish to subscribe to my blog via email. I did away with Google+ since they bailed on that product and of course, I can be found on Twitter and Facebook. I always do return visits provided it's an easy find. Sometimes people forget to leave a direct link in comments or they do not use the right URL when they sign in. If I have a way back to someone's blog then I'm there! The only thing that makes my blog unique is that I'm the author of my content, I share what makes me happy. Sometimes, it's original and other times I borrow from various sources mostly YouTube mewsic or funny memes. Oh, I generally do daily blog hopes throughout the year, so that's nothing new on me and it is an excellent way to build friendships & followers. I've been a part of the blogging community since 2010 and was immediately welcomed into the fold. What surprised me the most is how much I loved doing this! Come join me for today's Little Mermaid cartoon character, Dudley art sketch contribution! What a great spreadsheet! I am not participating in the AtoZ this year but my plan is to do a lot of reading and commenting. Your spreadsheet will help tremendously. I have made some great friends thru this challenge. Love that! In 2011, I just kind of jumped into blogging on a whim and worked on my book blog every single day for about 5 years! I loved it, and missed it when I stopped. Now I have three new blogs, also created on whims, and I'm using two of them for this challenge! It's been fun so far. D is for A Dog's Purpose! Trying to catch up with the prompts as much as possible considering the busy schedule. I started blogging some 11 years back ago while going through a rough patch. Writing helped me to heal.No ambition to make the blog look great. I just write. An online portal or I may say a diary. It comes to life when there are challenges to face. I run two blogs, one is in hiatus state and this one is active. Yes! Love your 10 decisions ;) I'm blogging since 14 years, and still love it!! Those questions are great food for thought. My blog has absolutely evolved and continues to evolve. I left a comment earlier this morning (see above, 8th from the top) with my direct URL and did a second post offering a bit of an update to it. If you're interested in checking out the Little Mermaid character art sketch Dudley Update then I'd love if you'd drop by. Have a good evening! Thanks for all the comments, everyone! Happy blogging! A self debate over the best media distribution format. Decisions are one of the toughest things to make and follow. But nevertheless, even if the try is a failure at times, determination and perseverance will help stick to our decisions. Nice list on blogging decisions. Great list that even has some pointers for old timers. And...yes, yes, yes - of course. Top questions before making decisions related to blogging! Building a community of blogger friends by sharing, reading and commenting is very important. Ha lots of decisions that I probably never even considered when starting my blog! It just seemed a nice thing to do at the time and I'm glad I joined in. This challenge often gives me a lift when my blogging habit is waning. Thanks to all the hosts for all the hard work behind the scenes and here on this blog. What a great list...I need to save this link for when I advise new bloggers. Thanks! !